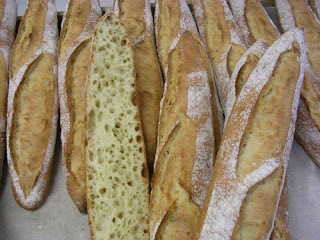 Gluten that is too short is difficult to process and results in a low volume yield, since the gas formed by the yeast is not able to expand the dough as it should. The problem can be solved by using substances with reducing properties that break down surplus disulphide bridges and thus give the protein molecules more room to move. 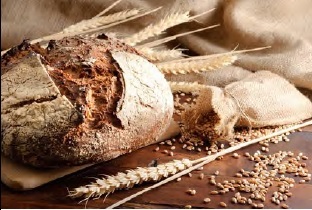 Short gluten properties may result from the varieties used, but they are sometimes caused by the storage and processing of the grain (overheating) or the use to which the flour is put (for instance, freezing shortens the gluten). 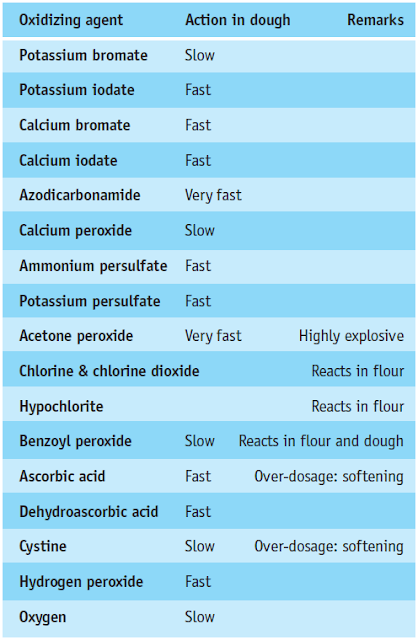 Some applications, in particular biscuits and crackers, require extensive softening of the dough for optimum processing and product properties. 1. Cysteine A suspected "opponent" of AA is cysteine, a simple amino acid that is a constituent of all proteins and produced either by hydrolysis of extremely cysteine-rich proteins such as those from feathers or hair and complex purification procedures, or by synthetic means. Chlorine reduces the pH because it is converted into hypochloric acid through reaction with water according to the following equation: Cl2 + H2O → HCl + HClO. The pH usually drops to 4.5 - 4.7, and in flour for certain cookie applications it even falls as low as 3.5. But the acidity is not responsible for the improving effect, since the latter is retained even after neutralization (Kulp et al., 1985). Cystine is the dimer of the amino acid cysteine in which two molecules of cysteine are linked by a disulphide bridge (Fig. 110). This sulphur bridge gives the molecule a certain oxidative effect. But at low doses it is possible that the gluten may soften, as reducing cysteine is released when cystine reacts with thiol groups of the protein. Although this has yet to be thoroughly investigated, cystine is used in spite of its high price compared to AA because it is occasionally found to have a positive effect on the properties of the dough. 5. Dehydroascorbic Acid DHAA is the oxidized form of AA (Fig. 111). This means that if DHAA were used instead of AA it would be possible to dispense with the initial step of oxidation. Tests have shown that this is quite possible. One reason why it is so rarely used, however, is its instability, but this could be improved by coating. A further problem is that it is more difficult, and thus more expensive, to synthesize. One enzyme from soy flour, lipoxygenase, also has an oxidative effect on the protein of the gluten. During the oxidation of the lipids by lipoxygenase, peroxides are formed that have a cross-linking effect on thiol groups. However, the gluten-strengthening effect of soy flour is comparatively slight; its bleaching effect is more important. There are several types of lipoxygenases with different action patterns. While type I lipoxygenase only acts on free unsaturated fatty acids, types II and III also oxidize unsaturated fatty acid bound to the glycerol backbone. Bean flour contains mostly types II and III, which makes it an efficient agent for oxidizing all unsaturated lipids in flour. The use of lipoxygenase is limited because the enzyme creates a "green" flavour that is not desirable in this application. The present necessity for oxidative treatment might be regarded as a disadvantage of the fast and gentle processing of grain into flour. 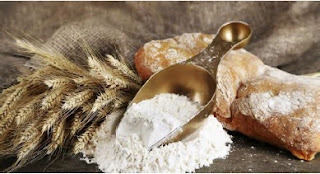 Natural ageing of the flour by exposure to the atmosphere alone is no longer possible, so maturation has to be speeded up with oxidative preparations. Oxidation primarily affects sulphur containing amino acids that are constituents of the gluten. The oxidation of two adjacent hydrogen sulphide (thiol) groups results in the formation of a disulphide bridge between different sections of the long gluten molecule or between different gluten molecules. This causes a hardening of the protein.